We now know that the first collection of Judd Winick's DC New 52 Catwoman series will arrive in May 2012, and I'm very curious to read the first arc in one book. We know from Winick's Green Arrow and especially from his Outsiders that Winick is not someone who writes without consciousness or thought, and I would like to see if I can find some semblance of that in Catwoman outside of mere pruriency (my outside guess right now is that Winick's Catwoman is a twisted exploration of cosplay culture -- just a guess). I'm all the more interested in a comic where Winick seems from the outset to have failed because the second volume of Justice League: Generation Lost is in my estimation about as close to a perfect comic as we come. It's a thick DC Comics hardcover; the plot is exciting, moving, and unexpected; three different artists remain in relative lock-step; and there's depth here -- the heroes are neither so right nor the villain entirely so wrong. Hands down, Judd Winick and company have done a knock-out job here. Generation Lost is good in a lot of places, but it's especially good in its last chapter. We have, in two parallel scenes, the long-awaited climaxes we never knew we were awaiting -- Booster Gold and the new Blue Beetle each avenging the death of Blue Beetle Ted Kord at the hands of Max Lord. Beetle Jaime Reyes saves the day by infiltrating the control system of Max's OMAC Prime robot and then shooting the robot in the head, a fitting call-back to Max's murder of Kord. Booster takes the fight to Max himself in a remarkably dialogue-heavy couple of pages (to Winick's credit). By now the reader understands that Max is not completely wrong in his "save humanity from the superheroes" philosophy, and Max and Booster are just similar enough in their egotism and have enough shared history that the pages just crackle, up to and through Max's defeat. Winick's story is all over the place, but in an engaging way and with plenty of characterization. One moment Captain Atom's fighting Magog, the next he's in the future, then the team's fighting the Creature Commandos, then they're fighting Power Girl, then they're up on the Checkmate ship, then Batman's there, then they're hunting Wonder Woman, and so on, and so on. Generation Lost never gets boring, but neither does it feel like it's all action. Along the way the heroes debate whether Max deserves killing (a second time); we learn plenty about Max's early life and his motivations; there's a rather touching scene between Fire and Ice when Fire's been mortally wounded; Fire and Rocket Red's romance; and Booster Gold's burgeoning leadership. All of this, and the book is funny, too. 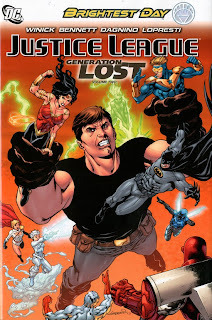 That the loosely-defined Justice League International characters are the "generation lost" never gets addressed specifically in the book, though Booster's leadership and the "attaboy" he gets from Batman in the end must certainly bring full circle what began over twenty years ago with the DC crossover Legends and the Justice League book that followed. Simple free association will always bring up the "bwa-ha-ha" comics in relation to Booster Gold, Blue Beetle, Fire, Ice, and others -- that is, these characters are all permanently marked as "jokes" -- but in their subsequent revisions since that time and finally in Generation Lost, they've finally emerged unarguably as heroes, said lost generation now found. They were, for better or for worse, the first Justice League of the modern era of comics, the first ones into the breach, and in essence paid for it with lack of credit for the next two decades. That era of comics comes to a close now with Flashpoint, and just as Barry Allen opened and closed the Silver Age with his emergence and death as the Flash, I'd venture Booster Gold getting the nod from Batman closes the modern age, with Legends to Generation Lost coming full circle (if only they could have fought Brimstone! Or Despero!). And despite that Generation Lost marks the pre-Flashpoint end for a number of these characters, I was pleasantly surprised to find DC even included six pages from the first issue of Keith Giffen/J. M. DeMatteis Justice League at the end of this book. It feels much too short, and the only connection between the characters in the excerpt and the Generation Lost team is Beetle Ted Kord and half a panel of Max Lord. I appreciated nonetheless, however, both DC Comics's sense of history and the continuing recognition that trade readers like previews, too. Only thing is, the book directs the reader to find more in the collected Justice League International volumes 1-6, furthering our suspicions that the series ends there and that volume 7 is not forthcoming. As opposed to its companion series Brightest Day, where the last volume felt choppy and inconclusive, Justice League: Generation Lost takes its time, ties up most of its loose ends (the changes to Ice's origin still seem rather for naught), and offers an immensely satisfying story. Again, in contrast to Firestorm and others in Brightest Day, if these character have to head to (pre-Flashpoint) limbo, this was a high note to go out on. Writer Dan Jurgens's post-Flashpoint Justice League International series has big shoes to fill. Coming up later this week, we continue along the "Justice League International" path with a review of the entire original Dan Jurgens Booster Gold series with Showcase Presents Booster Gold, including some interesting insights into Booster's psyche. Don't miss it! Glad to hear that this series served as a good send-off to the JLI. I read the new JLI #1 and was disappointed in it; it had been on my "to-buy" list before reading it, but lost that status with what I felt was a bland story. And I had enjoyed Dan Jurgen's recent Booster Gold work; not quite sure what happened there. Sorry to hear JLI #1 disappointed you; I heard similar dissatisfaction with Stormwatch today, and it's a shame since that and JLI were two of the title I was most looking forward to (will try them anyway, of course). Stop by tomorrow when I look at the entirely of Dan Jurgens's original Booster Gold series (in one book!) -- I liked it a lot, and found it much more complicated than I expected. I tried the first 3 issues of the new JLI and have been very disappointed with its simplicity and surfacey characterization. While Stormwatch is far from being my favorite of the new books, it is suitably intriguing to keep me continuing to sample it, but at the same time, not great enough that I will stop reading it and just wait for the collection. Forgot to say Generation Lost was awesome and one of the best superhero series I've read in years. Pending an update to both the DC TPB timeline, and the (hopefully not forgotten) Brightest Day Trade reading timeline, should Gen Lost Vol 2 be read before or after Brightest Day Vol 3? Justice League: Generation Lost Vol. 2 should specifically be read after Brightest Day Vol. 2 (as most might do anyway); it's not crucial that it's read before Brightest Day Vol. 3, but reading Brightest Day Vol. 3 last is probably better. Both the DC TPB Timeline and the Brightest Day reading order will get full Brightest Day updates.